More Power & MPG. Forces charge of cool, pressurized ram air into filter housing. Optimizes Ram-Air Intake efficiency for more power. Note: The Super-Scoop kit is designed to work on vehicles with factory sized wheels/tires. Running oversized wheels/tires may cause interference between the tire and Super-Scoop. 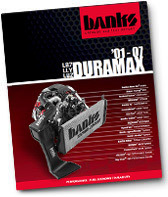 Banks' exclusive Super-Scoop¨ is an add-on product to the Ram-Air¨ Intake System. 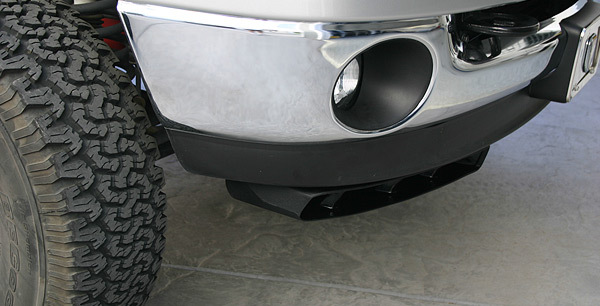 Super-Scoop connects below the front bumper, forcing a big charge of cool, pressurized ram air into the Ram-Air Intake's air filter housing. Because the air is drawn from outside the engine compartment, it has greater density and makes more power than the warmer engine air. 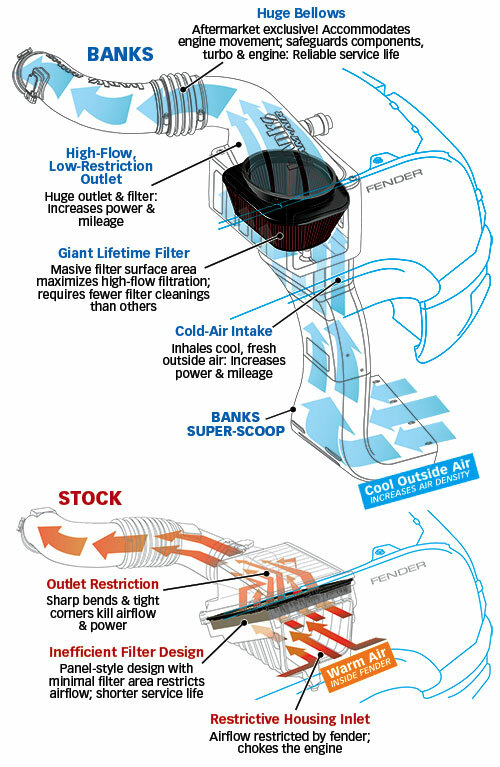 Super-Scoop’s cooler, denser air also improves fuel economy, reduces smoke and lowers exhaust gas temperatures! Rainwater and debris are funneled out of the bottom. The more air you can flow through your engine, the more oxygen will be available for burning fuel. That means greater, more efficient combustion, which results in more power. This is where the Banks Ram-Air Intake System with optional Super-Scoop¨ comes in. The cold air box’s huge bottom opening and optional Super-Scoop inlet are engineered to inhale cooler, denser air from outside the vehicle. Stock systems don’t draw the cooler air from underneath, and many aftermarket “filter on a stick” designs leave the filter wide-open to all the hot underhood air, which robs you of power. Customer Michael K. of Murrieta, CA installed the Banks Super-Scoop on his 5.9L Cummins. 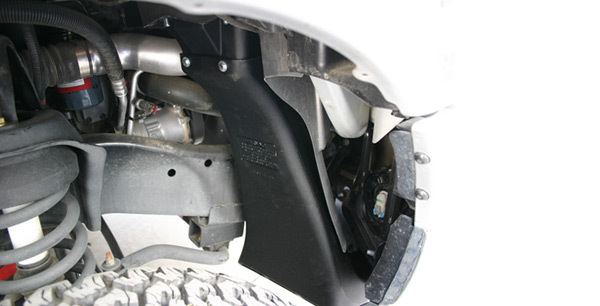 Installation on the 6.6L Duramax is similar.